News from Burgess that they've closed on the sale of their joint listing for sale with Oceanstyle by Burgess, the 36.5m motor yacht Vanquish, with James Auld at SuperyachtsMonaco representing the buyer. Built by US superyacht yard Palmer Johnson to Lloyd class, her exterior and interior styling is the work of the crack Nuvolari Lenard design team and she was delivered in 2006 as a stunning example of the PJ 120 series. 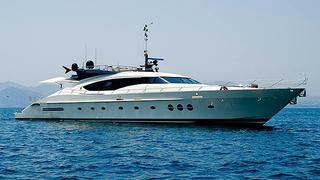 Vanquish had a major refit and upgrade in 2011 including a full repaint. With top speeds in excess of 30 knots, Vanquish is MCA compliant and has accommodation for eight guests in three doubles and a convertible TV room with twin berths. All staterooms have en suite bathroom facilities. An innovative sun deck design with a retractable staircase provides an unrivaled privacy concept allowing guests to seclude themselves. Twin 2,285hp engines give Vanquish a range of 1,100 nautical miles at her cruising speed of 22 knots and she was asking €5,850,000.